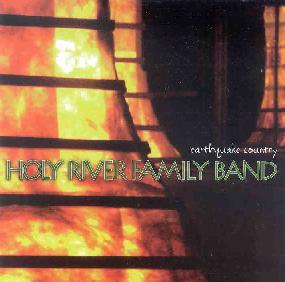 Holy River Family Band - "Earthquake Country"
This is the third full length release (I am not counting the Trio release) by this Swedish group that features three fantastic musicians who are true experts at producing music that creates very specific moods and feelings. All three members contribute to the lyrics as well as the vocals. This release is very different from the bands other releases. I would say it really reminds me a lot of Brazilian music at times and does not have the Middle Eastern feel that was apparent on the other CDs. There are even a couple of very Grateful Dead like songs ("Good Morning Friend") and the Pink Floyd influenced song, "Wooden Box". Another excellent collection of world rhythm music but less psychedelic in nature than the bands previous releases and one of the best song titles of the year, "Suffering from the effects of seeing Robert the artichoke, use the moisturizing formula". For more information you can email The Wild Places at: aceofdics@aol.com.